A new program that’s supposed to encourage farmers to produce halal, organic and other specialty types of chicken has ruffled the feathers of current producers, who say new quotas will prevent them from serving existing customers. 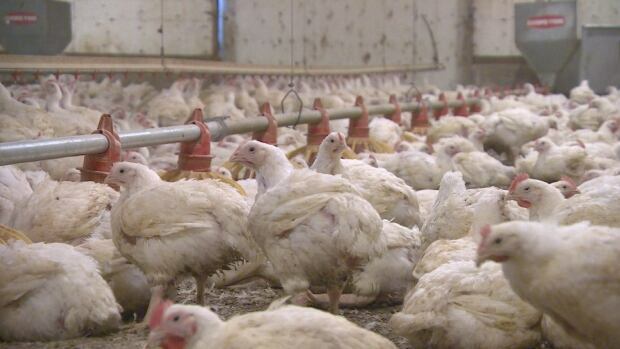 Manitoba Chicken Producers says its new specialty quota program — set to begin next year — is encouraged to get more farmers providing specialty chickens to under-served niche markets. But Rudy Reimer, co-owner of Watersong Farms, says the quota could force him to turn customers away. “It impacts more than just the growers themselves. It kinda goes down the chain. But in the end it really impacts the consumers, that they will have less choice of the type of chicken they can buy,” said Reimer. The change affects both specialty breeds — chickens that are raised with specific production methods, like free range or organic — and specialty slaughter practices, like halal or kosher certification. Chicken quotas are managed by Manitoba Chicken Producers, and registered farmers can only produce their allotted quota. The system is meant to ensure farmers produce only what the market demands. But some farmers who aren’t registered producers have already been working in the specialty market under special exemption permits for years. “Most of these were grand-fathered in over time, based on supplying a market that was unique and that wasn’t in direct competition with the broiler producers,” said Reimer. Watersong Farms has been growing roasting chickens since the 1960s. The family farm raises chickens that are bigger in size and sells them directly to customers. Under the new system, they will no longer be allowed their exemption permit. Instead, they will be forced to pay a 40 cent per kilogram levy on anything over their 30,000 kilogram allotment. Watersong currently produces between 75,000-80,000 kilograms per year, which means they will have to scale back to 30,000 kilograms or pay a penalty on about 60 per cent of their product. The latter is not an option, Reimer says. “To pass that on to our customers would be quite a jump, and we don’t feel that it’s right that we would have to do that,” said Reimer. Manitoba Chicken Producers says the program is designed to create opportunities for Manitoba farmers to supply niche markets. 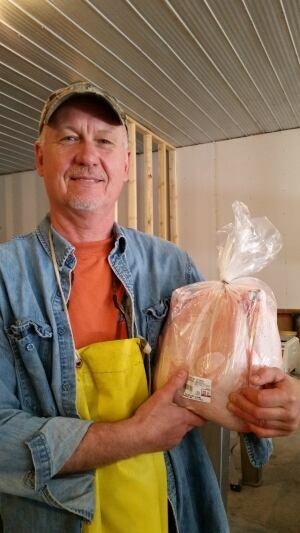 “We do realize that we have certain demographics within our provincial population that would be purchasing frozen chicken from out of province that would be along the lines of kosher, halal, or certified organic,” said Wayne Hiltz, executive director of Manitoba Chicken Producers. “The goal being that we are trying to give this opportunity to more producers, not just a few select producers,” he said. Reimer says any levy charged would end up being passed down to the consumer. It would also impact other parts of the industry, like processing plants. “The two-sided coin is that if we restrict these producers we are also putting pressure on the only processors that are out there to supply these markets,” he said. Waldner’s Meats in Niverville, Man. is one of few slaughterhouses in Manitoba that services smaller producers. The family-run business grows their own chickens for halal preparation, as well as doing custom preparation for other small chicken producers. “People that go to the farmer’s markets, their birds would be processed here. People that are just raising their [own chickens] so that they know what is going to be on their plate,” said Angela Chipilsky, manager at Waldner’s Meats. She says if the new rules cause her current customers to scale back production, she may have to scale back the processing plant, which would only hurt small producers further. “Family farms, they are dwindling,” she said. Reimer says he plans to scale back his chicken production because he doesn’t want to pay the levies. “We most likely will cut back our production significantly and that’s gonna hurt Waldner’s Meats because we are one of their largest customers,” said Reimer. When the new system comes into effect next year, Reimer says there may be a lot less product available. He says it will be difficult to have to turn some of his customers away. “You build these relationships, and you’re gonna lose some of them because of this,” said Reimer. Chipilsky says if they are forced to scale back their production they wouldn’t be able to meet their demand. She says passing on any levy to customers would make them less competitive. “If there’s a huge difference in price of course [retailers] are going to bring them in from out of province,” she said. “We have our customers, we’re not asking to increase, we’re just asking to keep what we’ve been using all these years,” Chipilsky said.